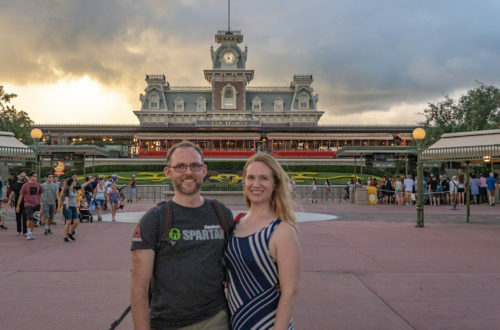 AJ and I kicked off our Disney Global Tour in Orlando with trips to Walt Disney World’s water parks, Typhoon Lagoon and Blizzard Beach, on consecutive days. I know that a lot of people wouldn’t necessarily have the time or the desire to go to both of them, so I got to thinking: if I had to pick just one, which one would I go back to? Below are some details about our experiences at these uniquely-themed parks and my thoughts on which park is better. The good news is that both of them were way better than any water park I had been to before! 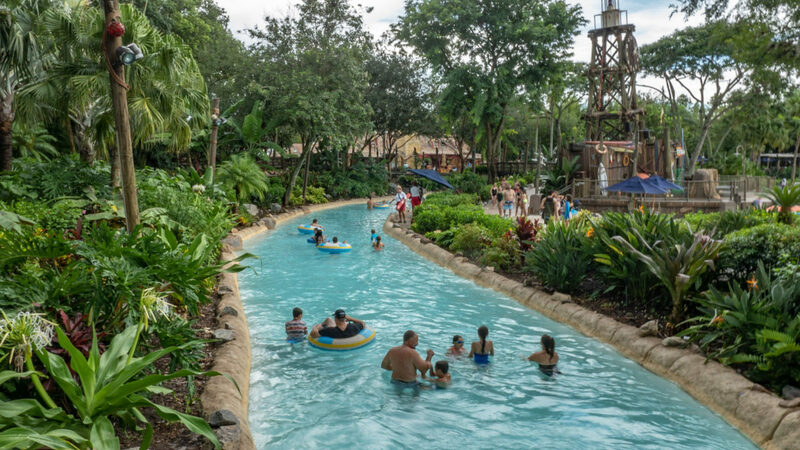 Typhoon Lagoon is themed to look like a tropical island after a hurricane. Sign posts are lopsided, surf boards and other items are strewn about, and there’s water everywhere. There’s even real sand! We arrived just after opening, which was 10:00am, and met up with Becky and Jason, AJ’s sister and brother-in-law, who spent the week with us in Florida. There were tons of people already streaming into the park when we got there. We hadn’t really done much research on the water parks, especially compared to the planning we’ve done for the rest of the Global Tour, so it took us a while to get our bearings. We had to figure out the locker rental and the towel rental at Singapore Sal’s. Then we decided to stake a claim on some lounger chairs, which we ended up not using at all. The first ride we went on was the Crush ‘n’ Gusher, a two-person tube ride that is much like a roller coaster. It was just my speed – not “I might die” scary, but still thrilling. This ended up being the favorite ride of the day for both AJ and me. From there, we made our way around the park, prioritizing rides and slides with shorter lines, and coming back to the others when the lines shortened. Warning: Humunga Kowabunga may cause painful wedgies. That was definitely my least favorite ride of the day. Unfortunately for us, a big storm moved through in the middle of the day. This is kind of par for the course for an August day in Florida. 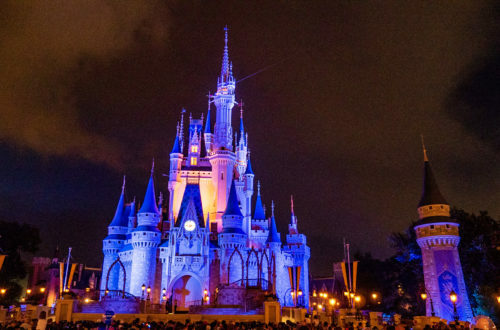 At most of the Disney parks, you can fill up your time with shows or indoor rides in the event of a thunderstorm. In the water parks, you have to get out of the water and take shelter, and you can’t get back in until 30 minutes after the lightning has stopped. We were already crunched for time that day, since we had a late afternoon reservation for The Void at Disney Springs. The mandatory hour-plus break was not ideal. We tried to make the most of the time by getting some lunch. Prior to the trip, I had been bracing myself for bad theme park food. You know, fried everything and not a vegetable in sight. We chose Leaning Palms and its adjoining covered picnic area for our lunch, and I was very pleasantly surprised that they actually had some healthier options. I had a chicken rice bowl with beans, corn, and plantains. It was still lacking in green vegetables, but it was tasty and most certainly healthier than chicken fingers. AJ had some sort of island-inspired hamburger that had pulled pork and pineapple on it. He said the burger was pretty good, and the fries that came with it were really good. The storms clouds roll in behind Typhoon Lagoon’s wave pool. Once the torrential downpour had stopped and we’d finished lunch, we got in line for Miss Adventure Falls, which had had a 60-minute wait earlier in the day. 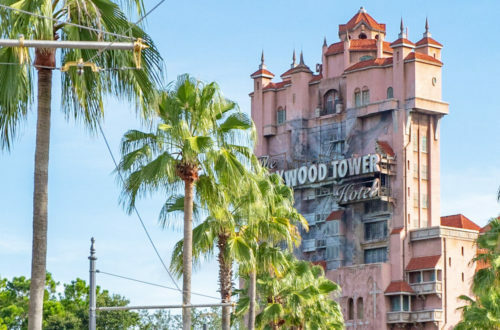 Once they sounded the all-clear for the rides to get going again, the line went pretty fast. Because of the storm and our afternoon schedule, we had to leave before we had a chance to do everything we wanted to do. We missed out on a couple of the slides, and we didn’t make it into the Typhoon Lagoon Surf Pool at all. Becky and Jason did, though, and they said it was awesome. It sure looked like fun! 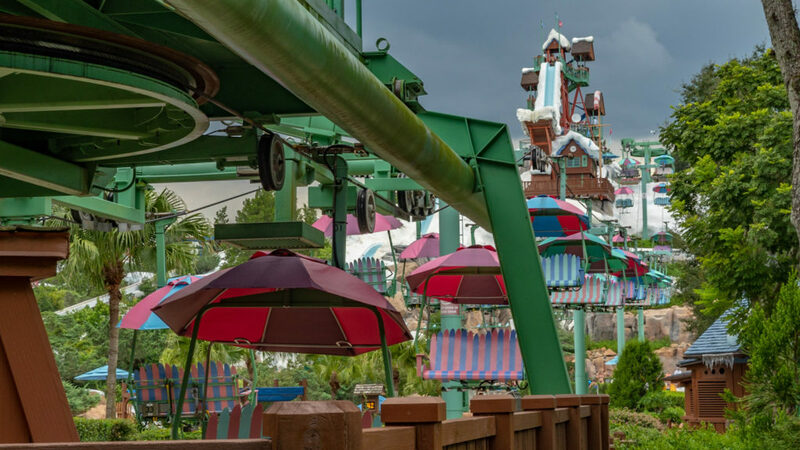 The idea behind Blizzard Beach is that Florida got a lot of snow, and somebody opened up a ski resort to capitalize on it. When the weather returned to normal and the snow started to melt, they turned it into a water park to avoid losing money on their investment. There are melting icicles, mittens and socks hanging out to dry, Christmas music set to Reggae beats, and even a chair lift. AJ and I slept in that day, since we had been at the After Hours event at the Magic Kingdom until 1:00am the night before. We had breakfast with our friends Samus and Adam and hugged them goodbye. It was a little before noon when we got to the park. Right away we noticed that it was less busy than Tyhoon Lagoon had been the day before. By then we knew the drill with the locker and towel rental, this time at a place called Beach Haus, so we were quick to get in line for our first ride. The park is divided into three slopes – purple, green, and red. We knocked out all three of the attractions on the purple slope first. Two of those are toboggan rides, where they give you a mat with a curve and handles on the front, and you go down the ride head first. I was a bit apprehensive about the head-first part, but both of those rides were a lot of fun. One of them, Toboggan Racers, has you race against several other people to the bottom. AJ won that one by several body lengths, which I could see perfectly from my vantage point near the back of the pack. After that, we headed over to the red slope, which has one line for two different slides. The wait was 90 minutes, and we have no idea why. The park wasn’t even that busy! Rather than waste a precious hour and a half, we decided to move along and come back later. We stopped for lunch at the cleverly-named Lottawatta Lodge. Just like at Typhoon Lagoon, they had chicken rice bowls, this time with green vegetables! We both got that, along with a fruit cup, which was mostly melon, much to AJ’s dismay. After lunch, we decided to head to the three rides on the green slope. The first one was a family raft ride. It wasn’t too noteworthy, but it at least it was long. It’s nice to feel like you’re getting your money’s worth after the long trek up the stairs. While we were up there, we caught a glimpse of Blizzard Beach’s most popular thrill ride, Summit Plummet. I took one look at the steep angle of that slide and said, “Nope. Not doing it.” The memory of the wedgie from the day before at Typhoon Lagoon was still foremost in my mind. So, on our next trip up, we split up. AJ went to the line for Summit Plummet, and I opted for Slush Gusher, the tamer version. AJ said that Summit Plummet was indeed painful, but not in the way that I was expecting. He had some pretty angry-looking red spots on his back where the water had lashed him on the way down. Ouch! He was still glad he did it once, though. You can see every Disney World park from the top of the slide, including Cinderella’s castle in the Magic Kingdom, and the various spires that stick up from the tallest buildings in the parks. Since we didn’t get to spend any time in the lazy river at Typhoon Lagoon, we did that next. We opted for a double tube so that we could float along together, a choice I later came to regret. There are cold waterfalls over the river that are meant to be melting snow. AJ steered our tube around so that I got doused in cold water a few times. By the way, have I mentioned that I really don’t like cold water? We got out of the lazy river near the red slope. By then, the wait was down to 15 minutes. The red slope is one line that splits in two at the top of the hill for two different slides. One of them is open-air and one is enclosed. A lady who handed me her tube at the bottom of the hill said we should definitely do the enclosed slide. We had already planned on the open one, so that’s what we did. It was pretty boring. We should have listened to the lady. Luckily the line was still pretty short, and we still had a little bit of time before we had to leave to get ready for dinner with my aunt and uncle, so we went back up for the other one. The enclosed slide on the red slope was our favorite ride of the day. On a scale from boring to Summit Plummet, it was about a seven. Perfect. We left a little after 4:00pm. I thought four hours was a really good amount of time, but AJ wished we had another hour or so. He would have liked to float on the lazy river some more and spend some time in the pool. 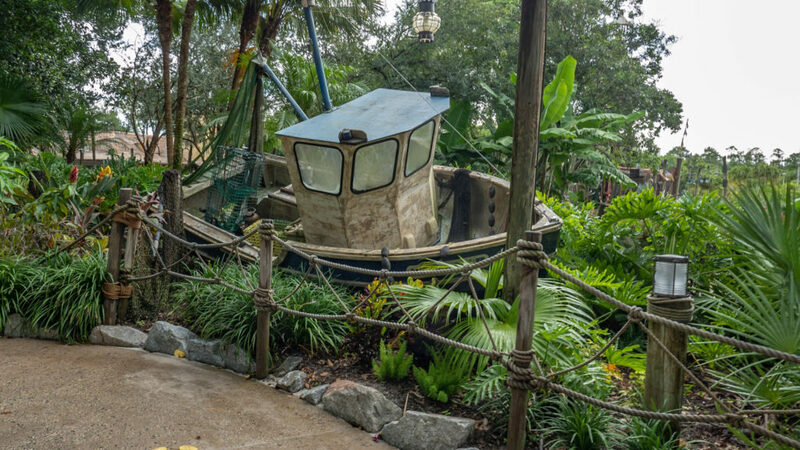 I personally enjoyed the theming at Typhoon Lagoon more. 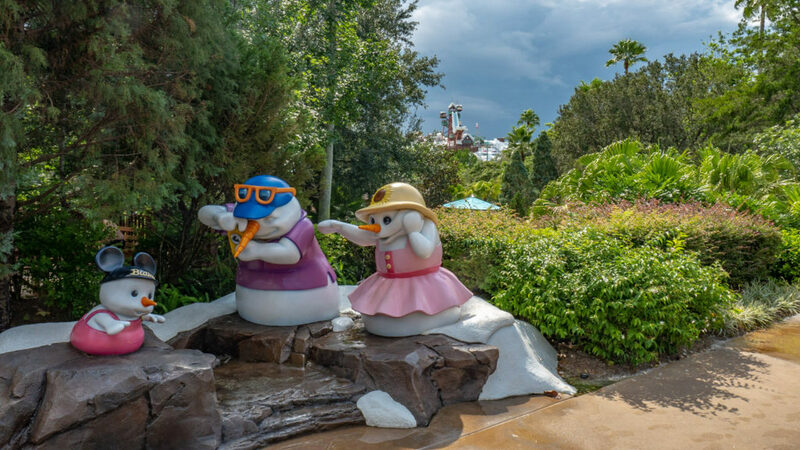 The snowmelt story at Blizzard Beach seems like a bit of a stretch to me. 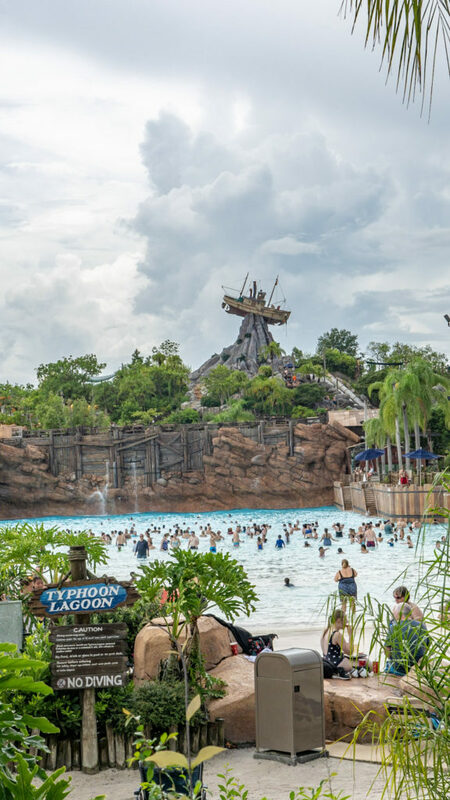 Typhoon Lagoon is also bigger and has the wave pool, which looked really cool. You can even take surf lessons there. There are more attractions there as well, and it seemed like there was something for pretty much everyone, whether you’re a thrill seeker or just want to lounge all day. Blizzard Beach seemed to have more attractions for little kids, so we thought it would probably be better for younger families. They also have a better lift system for the tubes and toboggans. 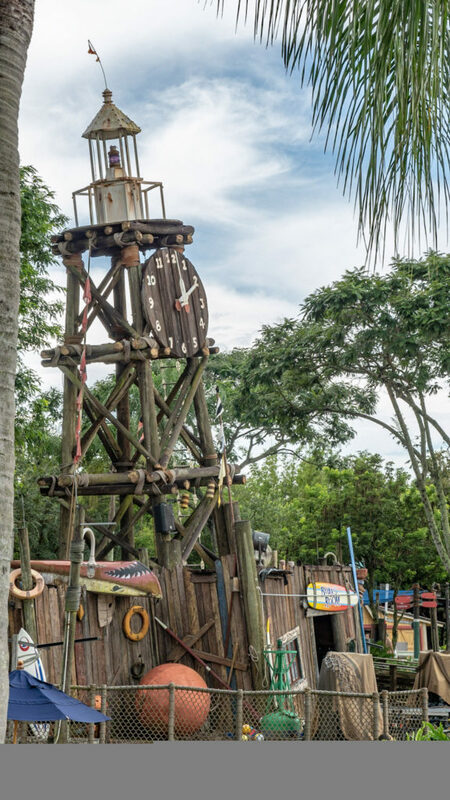 That way you don’t always have to carry your tube up to the top of the slides yourself like you do at Typhoon Lagoon. While both parks have shaded cabanas and umbrellas for rent, Blizzard Beach had more shaded areas in general. If you can, you should do both. If you have to pick one, I would say Typhoon Lagoon for adults and older kids, and Blizzard Beach for families with young kids. Obviously, you need a good sunscreen for a water park. We’ve been using Neutrogena Beach Defense SPF 70, and we really love it. We purchased the spray-on kind. It isn’t greasy at all, and it even smells good. Both of the water parks have two sizes of lockers. The large one was enough to fit a backpack, another bag, and various cameras and shoes. The small one looked pretty small. You should definitely leave all of your stuff in the locker, including your phone. AJ had his phone in his pocket at Typhoon Lagoon, and it fell out on one of the slides. We had to wait 20 minutes for a diver to come a fish it out. Thank goodness the iPhone 8 is waterproof, even for that length of time! You can link a credit card to your waterproof magic band and use that to pay for stuff throughout the day. No need for Apple Pay. Most people, including AJ and I, walked around barefoot. Some people had on waterproof shoes. It would be a big pain to deal with regular shoes on the slides, so I wouldn’t recommend it. A lot of the walkways also have water sprayed on them, so nice shoes might get ruined. A lot. Of. Stairs. You will reach your stair climbing goal for the day, or maybe even the month. I did see handicapped entrances for some of the rides. You’d have to look into that ahead of time if you aren’t able to climb stairs. Towel rental is free for guests who are staying on property, and you can get as many towels as you need. Otherwise, it’s $2 per towel. Both water parks have fun adult beverages for purchase. If you want to partake, make sure you have your ID with you. You can re-stash it in your locker after you make your purchase. Whether or not you’re drinking adult beverages, you’ll want to make sure to drink plenty of water. I found that I kind of forgot to drink water, since I was constantly being submerged in it. For both parks, it seemed like the crowds waned quite a bit by mid-afternoon. A lot of people, especially kids, were tuckered out and ready to go back to the hotel for a nap. If you get there a little later in the day, you can avoid some of the long wait times. I opted to wear a one-piece swimsuit at both of the parks, and I was really glad I did. Some of those rides are quite rough, and I wouldn’t want anything, you know, popping out. A lot of women and girls were wearing two-piece suits and seemed to be just fine, but I was grateful for the extra security. Have you been to Typhoon Lagoon or Blizzard Beach? Tell us about your experience in the comments below!